Product prices and availability are accurate as of 2019-04-10 17:00:13 EDT and are subject to change. Any price and availability information displayed on http://www.amazon.com/ at the time of purchase will apply to the purchase of this product. Every busy family needs a set of high quality lunch boxes so each family has food ready to go. 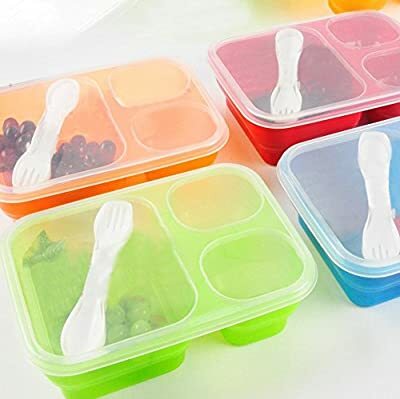 These food containers are made of food safe polypropylene which is very durable. They come in 4 colors, so you can easily color-code the lunches for each person in your family. You can put them all together in the fridge at night and in the morning, just grab and go! Unlike some lunch containers with lots of separate pieces to wash, this has one sturdy base and one lid, so there is less to keep track of and less to wash. The best thing is that they are dishwasher and microwave safe! Prepare your meal in advance and our perfect size compartments will keep your food fresh. The size of each piece is 9.7x7x2.4 inches. They fit in a standard lunch bag and they are ready to go because eating utensils are attached. 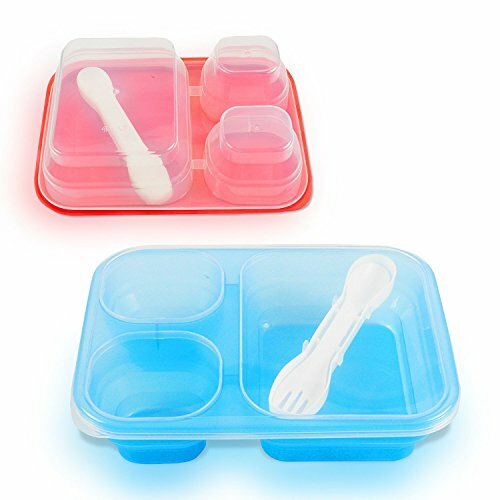 3 SEPARATE COMPARTMENTS - Keep food separated and control portions for healthy eating habits. Transparent lids make it easy to see inside each compartment and accessories are attached for ease of use. The size of each piece is 9.7x7x2.4 inches. EASY OPEN, KID-FRIENDLY - Kids and adults love the easy open lids. Food stays separated but are NOT LEAK-PROOF, so avoid liquids. Perfect for kids with big appetite, teenagers and adults, even those who don't like one food touching another! 4 COLOR CODED LUNCH BOXES - Perfect for busy, active families. Each person can grab their color coded set and go. Large size is perfect for big appetites, carry-along snacks and leftovers. 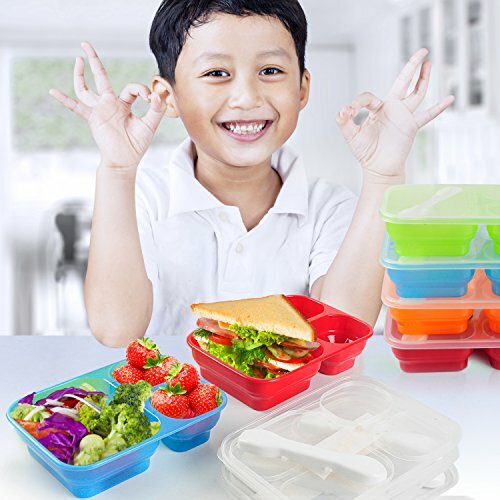 REUSABLE, SAFE and ECO-FRIENDLY - BPA free containers are food safe, durable and dishwasher/microwave safe. Reusable lunch boxes keep bags and containers out of landfills. MONEY BACK GUARANTEE: If you decide the product isn't for you at any time in the first 6 months, you'll receive a full refund of your purchase price.